A novel way to “eat” your favorite single malt. Martí Guixé bridges the gap between beverages and refreshments, creating an epicurean delight. The artist introduced a collection of biscuits that are specially created to compliment one of five alcohols – mezcal, red wine, vodka, gin, and whiskey. When paired with its particular liquor, the biscuit accents the distinct flavor notes of the alcohol – Embedded Drinks was created for Tapas: Spanish Design for Food, an event dedicated to food innovation. As simple as it may seem, the baking process of these biscuits is actually somewhat technical. Instead of using traditional cookie cutters, Guixé used 3D print modeling to create the biscuits’ unique shapes. The form of each biscuit was designed to enhance the taste of the alcohol after pouring, as well as the overall aesthetic appeal. 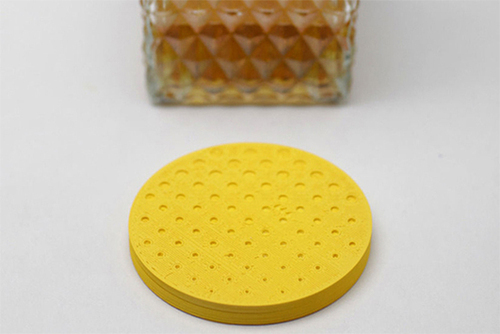 A puck pitted with holes, the whiskey biscuit was cut to retain different amounts of whiskey when dipped, and enhance the oxygenation process.